Genuine Thorens Drive Belt for Prestige- part number 6826130. Original, genuine Thorens factory drive belt. Only a genuine, factory Thorens belt should be fitted. This is the one! This is an affordable upgrade kit for the Pro-Ject Debut (all models) Xpression (all models), Pro-Ject 1, 1.2, 2, RPM 4 or RPM 5 (all models), designed to improve the sound of these models without needing to buy a whole new hi-fi turntable. PRO-JECT TURNTABLE MOTOR BELT. TURNTABLE COMPATIBILITY. Suitable for all Pro-ject turntables that use a suspension belt. 2mm Banana Plugs / Pins. Y Fork Connectors. AP B20/C, X 100D, AP B21, AP B1, AP B1C, AP 2110. Fits Akai An excellent quality turntable belt made to the exact specifications of the original. 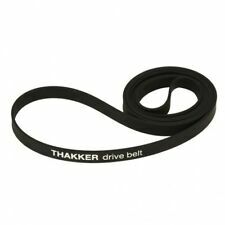 Thakker flat belt Typ 1 / Ø 160,0 x 4,0 x 0,8 / circumference: 502 mm. A fast handling and a good service is a matter of course for us. Der gute Ton ist unsere Leidenschaft. Why "williamthakker". Local pickup. FLAT SECTION DRIVE BELT 71mm x 0.6mm x 2.8mm (1 Belt) Folded Flat 112mm. PL117D, PL120, PL220, PL510, PL514. An excellent quality turntable belt made to the exact specifications of the original. Fits Pioneer. Fits Marantz 6025, 6050, 6100, 6110, 6200, TT 140. An excellent quality turntable belt made to the exact specifications of the original. PRO-JECT TURNTABLE TONEARM COUNTERWEIGHT. Counterweight COMPATIBILITY. Y Fork Connectors. 4mm BZA Banana Plugs. The belts are suitable fit for this turntable replacing the pitched belt - you place on TWO belts. We have these specially supplied to us from the Midlands motor component industry. 3/ It will not stretch over years of usage. PRO-JECT TURNTABLE MOTOR PULLEY. Phono Sockets. 2mm Banana Plugs / Pins. Y Fork Connectors. 4mm BZA Banana Plugs. 4mm Banana Plugs. TURNTABLE COMPATIBILITY > This upgrade is compatible with the following Pro-Ject turntables. By tuning the pressure on the gromits with the screws, the result is a dramatic reduction in unwanted vibrations from the motor, causing less resonance in the overall sound performance. Replacing the motor suspension belt on turntables can help lower the noise floor if the turntable is picking up excessive vibrations due to a worn suspension belt. TURNTABLE COMPATIBILITY. Type: High quality MOTOR SUSPENSION BELT. Only a genuine, factory Thorens belt should be fitted. This is the one! Geniune Thorens Drive Belt 6800574. Original, genuine Thorens factory drive belt. Counterweight for 9c and 9cc Tonearms (009). PRO-JECT TURNTABLE TONEARM COUNTERWEIGHT. Counterweight COMPATIBILITY. 4mm BZA Banana Plugs. 4mm Banana Plugs. Thorens Turntable Drive Belt (Genuine Thorens Part). Rega Turntable White Drive Belt Upgrade (Genuine Rega Part). Rega Turntable Drive Belt / Original Cleaning Wipe. Turntable Belts. Pro-Ject Turntable Spare Parts. PIONEER PL-221Z Stereo Turntable, Near Mint, in Original box. No scratches in cover. See Pictures. These belts will equal or exceed originals. Made of quality rubber engineered for perfect fit. Type: High quality rubber standard drive belt. Application: Fits almost all kinds of platter turntables. Drive belt for all models except the Space 294. Belt life may be influenced by a number of factors - use, temperature and humidity. If you find you are no longer enjoying your Nottingham turntable, it may be because of slight rotational variations caused by a loose belt, so it's time to buy a new one! Priced Individually.. FITS THORENS TURNTABLE MODELS: TD160MkII, TD160 (B) MkII, TD166 MkII & TD165. Oxford THAT'S Quality Turntable record Player rubber Drive belt. THAT'S AUDIO HIGH PERFORMANCE BELTS - Replace your used drive belt with one that has recently been produced, and which is of correct size - one that provides the correct tension and grip to avoid the belt slipping on the turntable drive, or being overly tight which slows down the motor. ISOkinetik ISObear Ruby Sapphire bearing for Rega planar 3 P3 turntable Rega planar 1 p1 turntable RP1 RP3 RP5, Rega planar 5 turntable P5 Rega p3/25. FITS DUAL TURNTABLE MODELS: CS505, CS505-1, CS505-2, CS505-3 & CS505-4. THAT'S AUDIO HIGH PERFORMANCE BELTS - Replace your used pitch belt with one that has recently been produced. QUANTITY SUPPLIED: 1 x PITCH Belt. MOTOR SUSPENSION WEB AND DRIVE BELT SERVICE KIT FOR SUGDEN CONNOISSEUR TURNTABLES. The quality rubber used has the right elasticity to produce excellent results. This is a new service kit comprising of motor suspension web and a drive belt made to my exacting standards. The proper maintenance of your Oracle turntable will not necessarily involve replacing the springs. These springs have been designed for a load bearing capacity far superior to their application. They will last many years! Thorens TD 124 Original Thakker belt. Der gute Ton ist unsere Leidenschaft. Why "williamthakker". A fast handling and a good service is a matter of course for us. Local pickup. PL12A, PL25, PL31D, PL100, PL115D. An excellent quality turntable belt made to the exact specifications of the original. Fits Pioneer. These are new Drive Belt never use and it was used on the AR XA, XB and XB77 Turntable. FITS THORENS TURNTABLE MODELS: TD150, TD150A, TD150B & TD150 MkII. Oxford THAT'S AUDIO Quality Turntable record Player Drive belt. 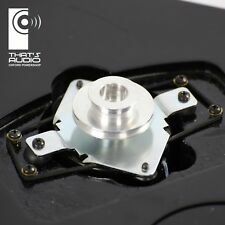 THAT'S AUDIO HIGH PERFORMANCE BELTS - Replace your used drive belt with one that has recently been produced, and which is of correct size - one that provides the correct tension and grip to avoid the belt slipping on the turntable drive, or being overly tight which slows down the motor. FITS PRO-JECT TURNTABLE MODELS: DEBUT. Oxford THAT'S Quality Turntable record Player rubber Drive belt. THAT'S AUDIO HIGH PERFORMANCE BELTS - Replace your used drive belt with one that has recently been produced, and which is of correct size - one that provides the correct tension and grip to avoid the belt slipping on the turntable drive, or being overly tight which slows down the motor. 25 x Plattenspieler Belt. Quantity: 25pcs. We will try our best to reduce the risk of the custom duties. Thickness 0.6mm. Pitch accuracy goes out the window when your belt stretches or wears. Original belt from Transcriptors for the Hydraulic Reference turntable. Pro-Ject Turntable Spare Parts. Turntable Setup Tools. Turntable Upgrades and Kits. AVID Acutus Turntable Drive Belt 1 x belt supplied. Rega Turntable White Drive Belt Upgrade (Genuine Rega Part). Rega Turntable Drive Belt / Original Cleaning Wipe. As belts age and wear, they dry out, stretch and lose tension,causing slippage and speed irregularities in your turntable. Thorens Turntable Drive Belt (Genuine Thorens Part). Buy the genuine product Peak HiFi are authorised Thorens dealers. Original drive belt.